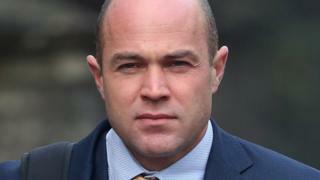 Emile Cilliers told the his mother that his marriage was difficult and he "wanted out"
An Army sergeant accused of trying to murder his wife by tampering with her parachute said he "wanted out" of the marriage, a court has heard.Emile Cilliers, 37, told Winchester Crown Court he confided in his mother after experiencing "difficulties" with wife Victoria.The court also heard he was having an affair with a woman he met online.Mr Cilliers denies attempting to murder Victoria Cilliers in 2015.The experienced sky diver suffered multiple injuries when she plummeted 4,000ft at Netheravon Airfield, Wiltshire. Under cross examination Mr Cilliers explained how his marriage was in trouble and he contacted his mother.Elizabeth Marsh QC, defending, said: "Forgive me for paraphrasing, but your mother's response was, 'pull yourself together and get on with your marriage' "Yes," he replied. Mr Cilliers also told the court he began an affair with a woman he met on the dating app Tinder at a time when he felt "far away from home" and when he felt he needed "female company". He described his wife as someone who was "very easily upset" and had told him she was feeling very low and "wanted life to be over".The court had previously heard Mr Cilliers would not be benefit financially if his wife died.He told the jury he did not object to signing a post-nuptial agreement which had been proposed by his wife.He said he signed on the understanding she owned the house but he would be in line for a pay-out should the marriage fall apart and they divided their assets. The couple also wrote wills in which he chose to leave 50% to Mrs Cilliers with the remainder to be split between his children, the court heard.Mr Cilliers denies tampering with his wife's parachute kit in a toilet cubicle.He also denies a second attempted murder charge and a third charge of tampering with a gas fitting at their home in Amesbury, Wiltshire.The trial continues.